Woodrow Wilson proved that challenges can be overcome. He had dyslexia and found reading, writing, and math difficult. He worked hard though and graduated from Princeton University. Later, he got a graduate degree from Johns Hopkins University and became a college professor. In 1902, he became President of Princeton University! 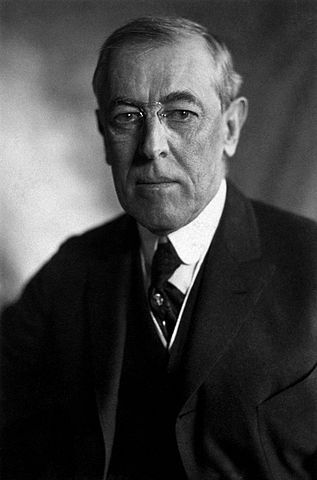 Wilson served two terms as our 28th President. He made changes to our federal money system, import taxes, and labor laws. He tried hard to keep the U.S. out of World War I. When German submarines started sinking American ships in the Atlantic Ocean, Wilson had no choice but to involve the U.S. in the war. Wilson was born December 28, 1856 in Staunton, Virginia. Some of his first memories were of the Civil War. His father and grandfather were Presbyterian ministers. Wilson prayed both day and night. Wilson served as governor of New Jersey and was quickly nominated for President. He believed the role of President was to be a servant to all the people of the United States. Wilson married Ellen Louise Axson in 1885. They had three children. He was distraught when she died. He later met and married widower Edith Galt. During the war, the Wilsons asked the American public to sacrifice so that resources could be sent overseas to soldiers. The President and his wife set a good example by going without gas, meat, or wheat on certain days of the week. Sheep grazed on the White House lawn so they could save money on gasoline and labor costs. Wilson worked long hours. He became ill and had a stroke during his second term. Edith kept his poor health from the public. She screened his calls and mail and sometimes even made political decisions for him. Woodrow Wilson has been criticized in recent years for his racist views. He removed black workers from government positions and reversed laws that helped black people. Wilson drafted a treaty for peace. He wanted to develop an international committee of nations that would solve conflict peacefully in the future. Wilson won a Nobel Peace Prize for his work, but the Senate ultimately rejected his idea. Question: Did the U.S. help win World War I? Answer: Undoubtedly. Over two million U.S. soldiers joined the front lines. Our country also gave food, weapons, and resources. The price was high, though, for all countries. In the end, 10 million soldiers died worldwide and the war cost more than $3 million. Learn more about Woodrow Wilson at White House.gov. Declan, Tobin. " Woodrow Wilson Facts for Kids ." Easy Science for Kids, Apr 2019. Web. 23 Apr 2019. < https://easyscienceforkids.com/woodrow-wilson/ >.